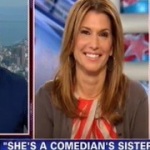 From Mediaite: Stephen Colbert’s sister is running to replace Senator Tim Scott in South Carolina. Does his status help or hurt her? CNN debated the topic today, Mediaite reports: “Democratic congressional candidate Elizabeth Colbert Busch is running a spirited race to replace Sen. Tim Scott (R-SC) who vacated his seat in South Carolina’s 1st congressional district when he was appointed to replace the retiring former Sen. Jim DeMint (R-SC). She faces an uphill battle in the heavily Republican district, but Colbert Busch has a not-so-secret weapon on her side: her brother, Comedy Central host Stephen Colbert. On Thursday, a panel on CNN battled over whether Colbert Busch’s association with her brother, and his active campaigning on her part, helps or hurts her campaign in the conservative Palmetto State.” Read what they thought here. 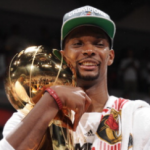 From Gossip Cop: The Miami Heat may be having a great season, but Chris Bosh got some bad news, writes Gossip Cop: “Chris Bosh of the Miami Heat had $340,000 in jewelry stolen during a burglary at his Miami home early Thursday, according to police. The NBA star reportedly called cops shortly after midnight after he and his wife Adrienne returned from a night out partying in celebration of his 29th birthday. Law enforcement sources say Bosh reported that a closet had been ransacked, with pricey possessions including watches, purses and rings missing. Miami Beach Police say the housekeepers who were watching the couple’s children during the evening have been questioned. Bosh’s championship ring was not taken.” Read on here. 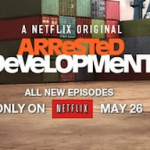 From Geekosystem: Long awaited-news has arrived: the date of Arrested Development‘s return. Geekosystem reports: “What are you doing May 26? Shut up, doesn’t matter, cancel all your plans right now. You have new plans, and they’re awesome, because you, like any decent, right-thinking person, are going to be watching 15 new episodes of Arrested Development when they arrive on Netflix at 12:01 PDT May 26. Netflix had the decency and wisdom to bring the show back on a Sunday, which means you won’t have to feel bad about marathoning right through five and a half straight hours of new Arrested Development, because seriously, what else are you going to do on a Sunday?” Read the full story here. From Styleite: Who does PAPER Magazine deem most beautiful this year? 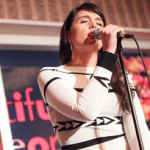 Jessie Ware! Writes Styleite’s Hilary George-Parkin, “It’s been quite a few years since we attended our last Sweet Sixteen party, but we’re pretty confident that whatever it was, it had nothing on PAPER magazine’s fête last night for their 16th annual “Beautiful People” issue. They decked out the Top of the Standard Hotel with shimmering confetti sculptures and larger-than-life balloons, and parked an impressive spread of pastel-frosted cupcakes in corner for partygoers like Thakoon Panichgul, Padma Lakshmi, and Cory Kennedy to Instagram (and, yes, eat) to their hearts’ delight… But birthdays aside, we were also there to celebrate British songstress Jessie Ware, the issue’s cover girl and well-dressed woman of the hour.” Read all about her here. From SportsGrid: Everything seems to be coming up Kevin Ware, after his gruesome injury on Sunday and speedy recovery. 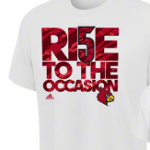 SportsGrid reports on the latest: “As a ‘respectful tribute’ to one of their players breaking a leg, the Louisville Cardinals and Adidas are putting out a ‘Rise To The Occasion’ shirt featuring Kevin Ware’s number 5. A fitting tribute indeed — though Ware won’t see a dime from it. The Cardinals’ program, already the most profitable in a nation by a wide margin, will reap the rewards instead. In response to a request from Ware’s teammates, Louisville’s ‘Rise’ shirts were outfitted with the number to be worn at the Final Four, and fan interest in the gear soon followed. The Univeristy of Louisville, perhaps sensing that making money from licensing their logo for this purpose would look, well, awful, waived the royalties that normally come these products.” Read on here. From The Mary Sue: Does Peter Jackson have a copy of the Star Wars: Episode VII script? The Mary Sue investigates a screenshot from a recent video: “At first glance you may not see anything in this photo but a desk but if you look closer you might see history in the making. Or an April Fool’s prank. We’re not sure. What you’re looking at is a still from this The Hobbit: The Desolation of Smaug preview video Peter Jackson posted on April 1. FirstShowing.net pulled a screencap from 4:51 in which you may notice, is a script to Star Wars: Episode VIII. I think we can say one thing for sure, showing it was not a mistake. However, we don’t know if this was meant as a joke (he does have a great prop department at hand) or meant to drive nerds completely out of their minds. What do you think?” See it for yourself to decide here. From The Jane Dough: What would Betty Draper’s resume look like? The Jane Dough writes: “Imagine that Betty Hofstadt Draper Francis time-traveled, read The Feminine Mystique and Lean In, and was inspired to join the modern workplace. What would the ‘Special Skills’ section of her resumé include, besides ‘messing with my daughter’s self-esteem’? And while we’re on the subject, what about Daenerys Targaryen? Shoshanna Shapiro? Michonne from The Walking Dead? Well, we’re all about making your dreams come true at The Jane Dough. Here are our best guesses for what their CVs might look like.” See them here. From The Braiser: Where are the lady chefs? 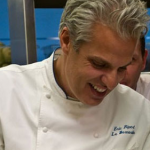 The Braiser writes, “Last night, in the wake of Veuve Cliquot announcing their list of the 50 Best Female Chefs In The World, we were included in a Twitter debate in which Eric Ripert attempted to tackle the age-old/newly popular question: should the food industry single out the accomplishments of female chefs,because they are female? But while he pinged as many people as possible to jump into the debate — including us — we noticed something rather unsettling: he specifically asked for the opinions of his culinary peers, but did not invite a single female chef on Twitter to chime in.” See all the tweets, and some female chef responses as well, here.